His voice cracked with guilt: ‘I’m seeing someone else’. ‘Who is she?’ she asked. Eleanor Blake, distraught after breaking up with her fiance Will, decides to do what most would scarcely dare: secretly follow him to the island hideaway where he’s on holiday with the woman who took her place. But on the shimmering, sun-drenched Sicilian island of Panarea, distractions come in many forms – including her fellow hotel guest Lewis, an enigmatic Englishman with secrets of his own. 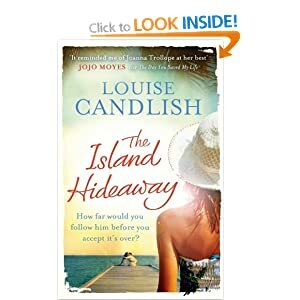 I have read a few of Louise’s books now, I have to say this wasn’t her best one but I did enjoy it. The story was a good one but I found I was a little disappointed with the ending it left me wanting more. Louise describes the settings and surroundings brilliantly, I felt like I was there. This book was previously published as ‘Prickly Heat’ in 2004, but I didn’t miss the opportunity to read it. Nice easy read. I love her books especially ‘Since I don’t have you ‘ – it continues to haunt me.